A card carrying member of All Progressives Congress (APC) who contested the primaries together with late governor elect in Kogi State in 2015 Prince Abubakar Audu, Prince Sani Shuai’bu has faulted the leadership style of current governor of the state, Yahya Bello describing it as display of accidental agenda. The Group Chairman of Harish Group, who also contested for the House of Representatives under the defunct Congress for Progressive Change (CPC) in 2011 lamented that, the people of Kogi are not getting the leadership they deserved under the current political leaders in the state saying, they still have option come 2019. The Kogi born politician who was speaking at the Northern Youth Leadership and Economic Summit in Kaduna over the weekend observed that, though leadership and governance are closely related, but the leadership itself which is earn over time plays a key role in delivering good governance to the citizens of the state. According to him, ‘‘governance and leadership are two different things. You can be appointed to govern, you can be nominated to govern. But governing itself has to be embedded in quality of leadership experience you must have earned over time. Like I said, leadership you earn it and that is what is happening in Kogi State today. “I think the crop of leaders that manage affairs of Kogi state today are either by accident and it is obvious that, they have different agenda and that agenda is what they are displaying now. This thing does not end in Kogi State but extended to the national. ‘’If you look at the nomination and appointment that Mr President is making from Kogi state today, people like us are not contacted. Mr President knows my commitment when he was campaigning because I believed he can deliver, I gave him that support. I know what it takes. I know what it cost me and my people to stand behind and supported him. I never voted for the governor of our dear state today. I voted for Prince Abubakar Audu. I supported Audu not because Bello is not an Igala by tribe but because the APC candidate in that election was prince Audu. 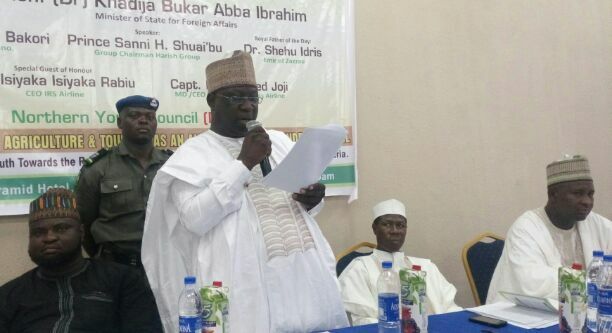 Speaking earlier on how Northern youths could help the federal government realize its economic diversification, Sani said it is the high time the leaders from the region woke up to the reality onground and took advantage of viable, smart, intelligent and energetic youths that abound within the region to invest heavily in agriculture. “If you cannot be there for these our wonderful youths when they need your attention by away of guidance and tutelage, you can’t call then to order when they are causing trouble. And youth should learn how to respect and not to insult their leaders at all time and make themselves available to learn and key into agriculture”, Sani added. Earlier in an address, President, Northern Youth Council who organized the summit, Comrade Abubakar Isah lamented that, the northern part of the country is faced with many challenges ranging from poverty, illiteracy, unemployment, diseases, robbery, kidnapping among other social vices bedeviling the region with consequences already manifesting. Isah then called on the leaders from the region to associate, talk and educate their youth whenever they called on them for guidance and directives for the betterment of the region and the country at large.